Unique design rustic country bridal shower invitation featuring two horseshoes tied with old twine ribbon. 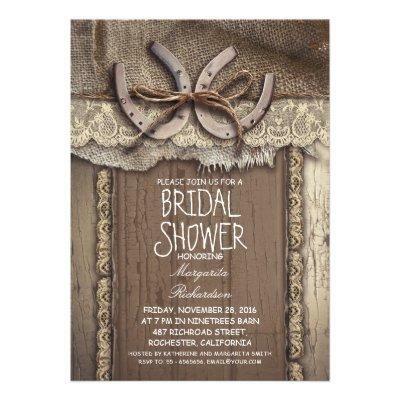 This western bridal shower invite is full of all charming details: decorated with ivory lace, composed on the old barn wood background and piece of burlap invite for farm, barn and village bridal shower with western / country themes and horseshoe centerpiece accents. Please contact me if you need help with invitation customization, need more products or have a custom color request. -------If you push CUSTOMIZE IT button you will be able to change the font style, color, size, move it etc. it will give you more options!You can find more RUSTIC INVITATIONS or WESTERN INVITATIONS in my store.